This course is designed to introduce students to the fundamental language, principals and tools of Lean. 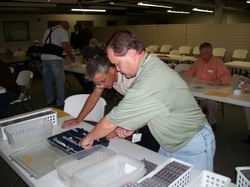 Participants enjoy a 4 or 8-hour, fast-paced simulated learning environment where they absorb their lessons through hands-on application of the tools and concepts of Lean. Afterwards, students are required to complete a simple improvement project within their own work areas to show evidence of practical application and provide the organization with a return on their investment. Course price includes a follow-up session with the participants where they share their project completion details and improvement ideas. Who should attend: Employees at all levels of the organization who are new to Lean or new to planning and implementing improvement projects.